The new Altair® 5 Multigas Detector Series, from MSA, raises the bar once again with five-gas capability, over 17 preprogrammed languages and high-resolution, crisp color display options. 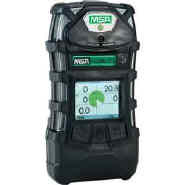 Not to mention, they are the only one's available with MSA's exclusive MotionAlert™ and InstantAlert™ features. Ideal for confined space applications, the MotionAlert™ feature activates a "man down" alarm if no motion is detected for 30 seconds, while the InstantAlert™ feature activates to warn others of possible danger. Units come with a lithium-ion rechargeable battery for 15 hours of operation between charges. Two-year warranty.